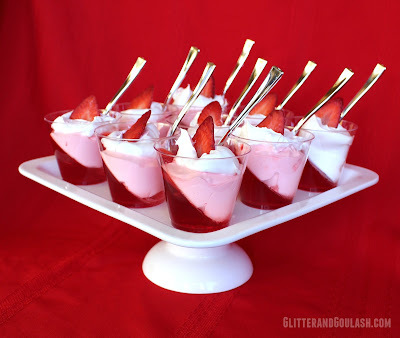 I made these Strawberry Jello Parfaits recently for a birthday party that I had (Black & Red Party Theme Ideas) and they were the hit of the party! I love this recipe for many reasons; they are super easy to make, they can be made up to two days in advance, the flavor of Jello can be changed to match your party colors AND they are delicious!!! Make Jello according to package directions. Chill until slightly thickened (about 15-20 minutes). Set aside 1/3 cup of liquid Jello. Add strawberries to remaining Jello. **Spoon mixture into glasses. 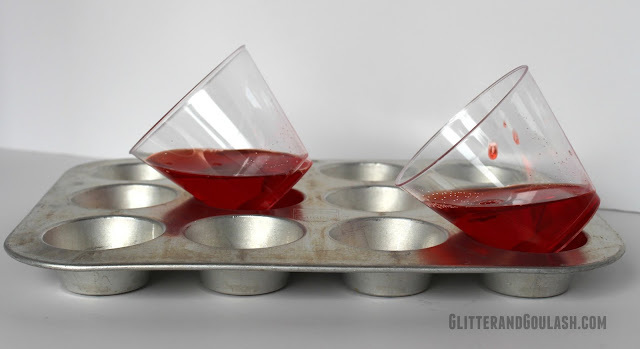 Chill glasses at an angle (propped in a muffin tin) until Jello is set. 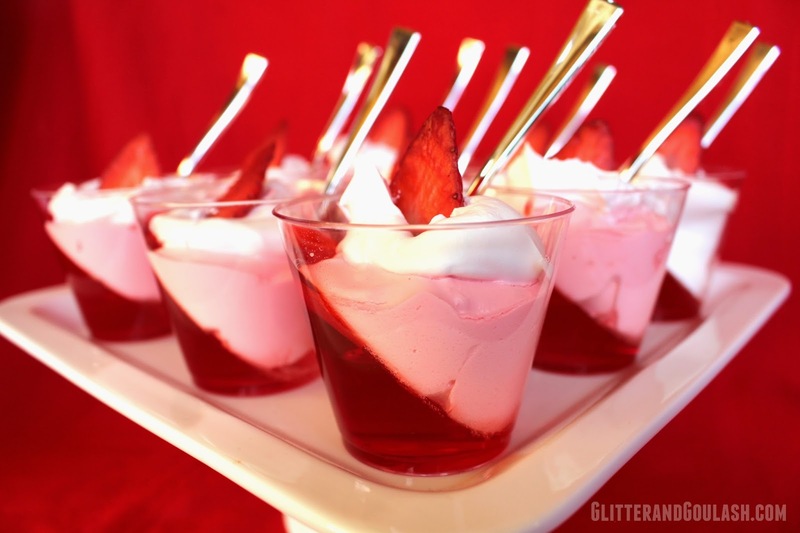 Once the Jello is set, spoon topping mixture into glasses of set Jello. Lastly, garnish each glass with one spoonful plain remaining Cool Whip and fresh sliced strawberries. Place on a platter for a stunning display at any party! **For this particular recipe, I like to use little plastic 5 oz. cups. They are the perfect appetizer size for parties, after school snack, or an addition to a cold lunch. This recipe will make 8-10 5 oz. servings. Extra Tip: I usually double this recipe for parties as they go fast!